Vaastu Shastra Pooja Room:In this image one dais or a platform was constructed at East direction area, this platform is using to keep God Idols on it for prayers. Generally this may not be the good, as the platform was constructed towards East direction. If this is very lesser weight and smaller one then no problem, for example, if it was only 8 inches height and 24 inches length and 12 inches width then no problem, if it was 2 feet height and occupied lots of place then problem arises. The problems in the sense is where is the pooja room, in which location it was constructed etc has to be counted for evaluation. We understand resident problems, in case if residents requires to keep God idols only towards East, then they may use the wooden open platform which is very lesser in weight and open to see the below of that platform, its just like a stool type or small bench etc. In such case, God will be facing towards West direction and residents will facing towards East direction. No problem at all. Please note that should be check in which location Pooja room was came, this would be count. If Pooja room came towards Southwest then it won't give rich results. Here the dais constructed towards West direction. 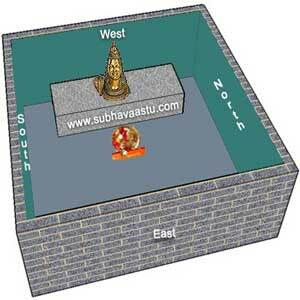 Now Lord Shiva, placed towards West side, in the above image dais constructed towards East side, here the dais constructed towards West direction, so we can happily construct the dais at West facing or West direction at pooja room, here god face is towards Eastern direction and residents face is towards West direction while doing pooja, this is said to be good position, we should not forget one thing, where is this raised platform room, if this room is towards Northeast facing house vastu, then again its not recommended to have the highly raised structure platform towards West too. 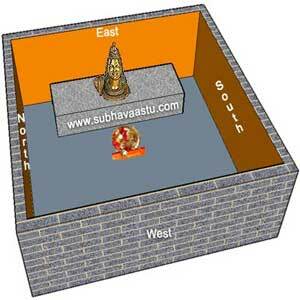 Because for the entire house this room came towards Northeast only, though the raised platform towards West may be good, anyway we should be careful once we deal with Vastu Shastra logical principles. Without logic there is nothing belongs to Science. Once we approach one of the best vastu consultant he will guide you the rest, only the problem is finding him is the biggest challenge now. He should have all qualities, like observation capacity, resolution capabilities, patience, honest, hard work, intelligence, friendly approach etc. In this image the dais is a independent one, its not touching the East wall, now you may observe the above images and this image, in above images the raised construction touched the wall, but here it was not touched the wall. Touching the wall towards West may be good, touching the wall towards East is not good, so following of the first image method is may not be good. Here the dais is being made with wood(FYI, it may not be clearly shown with wood, but please treat it as wood), not constructed with mud, bricks, cement, it is also acceptable, it does not create weight issues anyway. Its not a solid one as constructed with mud, cement or bricks. So no weight is coming towards East direction, selecting the Wooden stool or bench type is recommended, you may keep it towards West or East directions, no issues at all. Some residents may not has interest to keep God Idols on the wooden stool, in such case, they select Mandahasam, which you may clearly observe in next link, click the below learn more button link which shows with right arrow below. ( Here is a Story on Ganga and Shiva and our mythology):- Gangotri is a town and a Nagar Panchayat in Uttarkashi district in the state of Uttarakhand, India. It is a Hindu pilgrim town on the banks of the river Bhagirathi. It is on the Greater Himalayan Range, at a height of 3,042 m. The picturesque pilgrimage in the hinterlands of the Himalayas is the most sacred spot where Ganga , the stream of life, touched earth for the first time.According to mythology, Goddess Ganga – the daughter of heaven, manifested herself in the form of a river to absolve the sins of King Bhagirath’s predecessors, following his severe penance of several centuries. Lord Shiva received her into his matted locks to minimize the immense impact of her fall. She came to be called Bhagirathi at her legendary source. Kedar Tal ( 18 km) – An enchanting lake, 4425 mts. above sea level against the splendid backdrop of mighty Thalaiyasagar peak. Accessible through a rough mountain trail, it is the base camp for trekking to surrounding peaks. The trek to Kedartal needs a local guide. Is it OK to Place bathroom opposite to Pooja Room, but the Bathroom door is not opposite to Pooja Room... please give some suggestions - BhagyaLakshmi - Bangalore city - Karnataka - India. Vastu shastra says many things for humans happy life with harmony. If residents has more spacious homes then they can easily follow the entire principles of vastu shastra. Now a days every body acknowledges that there is a lack of space and people are living in tiny Home / Flats. With the available area of space we have to accommodate every thing. As per your question its not a problem. You may continue with the same. If there is possible then change this system of Toilet exactly opposite to Pooja room. As you already told that toilet door is not exactly opposite to the pooja room, then no need to worry. Which direction is best for kids bedroom? Like to download Maa Durga wallpapers, which link provides it? 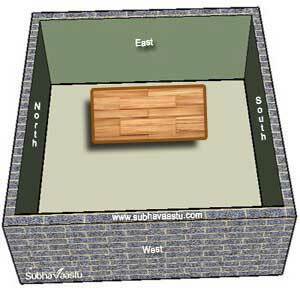 I have 60 X 80 plot, can I have a house plan with Vastu Principles? Some body says that bee-hive is not good at house, is they correct? Which link provides Hindu, Islam, Christian God wallpapers download link here? Constructing the compound wall or constructing the home, which one we have to start first? In my new house which side I keep murty Devimaa face in puja room? Is it OK to have water view, lake, swimming pool or fountain from the bed room or other rooms of the house?